With insulating chambers inside the vinyl profiles and several advanced glass package options, Sprouse windows and sliding doors set the standard for performance and longevity. Available in a multitude of styles for both new construction and replacement applications, Sprouse replacement products feature a host of decorative options combined with warm-edge technology to create the perfect blend of style and efficiency. 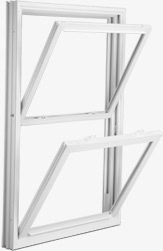 Fusion-welded frame and sash profiles are strong and resilient. Vinyl profiles won't fade or discolor with age.